Today is a good day. Want to know why? Other than the fact that I've got a nice cold cider in hand, I managed to overcome a problem that was almost driving me to tears. Nothing tastes better than a celebratory cider, especially after being so frustrated that you almost bawled like a small child. And we all know small children don't drink cider. The product of a day of almost-tears. The idea was that I wanted the names of towns and special places to pop up over them when the player got close to them. I used to have a script that made a line of text pop up over an event, but only if the player was facing it. 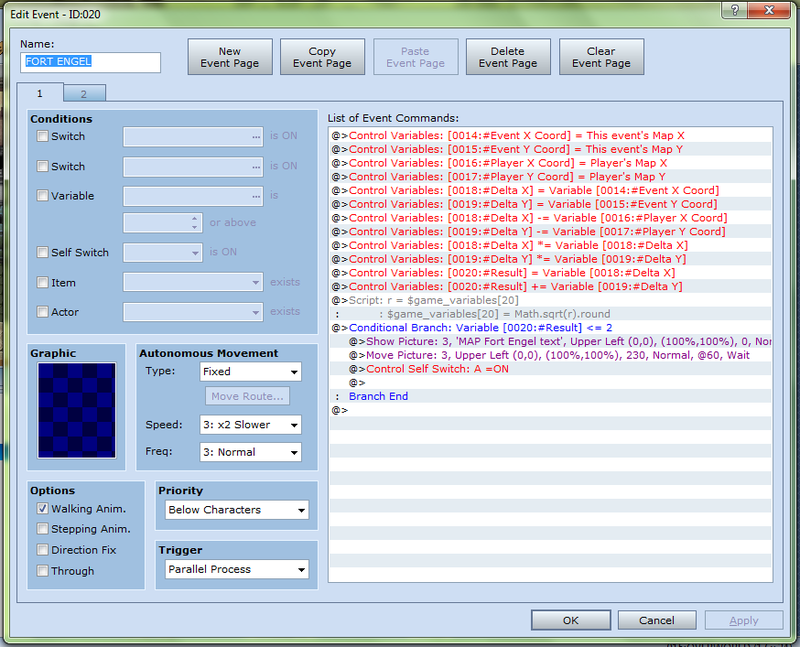 I wanted to change it so that it went by the player's proximity to the event. Unfortunately I don't speak Ruby and I can't script to save my life, so I was hoping that someone would come along and save the day. THIS DIDN'T HAPPEN. But that's okay. I spent all of last night searching for script calls that I could put into the events, to no avail. I found a few but they were all for VX Ace (my game's in VX, the engine before VX Ace). I gave up and went to bed, resigned to the fact that my world map would never have fancy names popping up over the towns. And it could have ended there. But it didn't. SUSPENSE. I managed to find an old topic on RPGMakerVX.net where someone was asking for a similar sort of thing (where an event would disappear if you got within a certain range) and BigEd781 posted a helpful solution. So I took his solution, changed a couple of things so it would do what I wanted and voila! IT WORKED. I am eternally grateful to you, BigEd781. My brother had a soft toy called Big Ted as a child and I kind of feel like it was he that helped me. Page 1 of the successful event, if you were interested. The second page looks the same, except with the Conditional Branch having the Variable > 2. And so, now I have a world map where if you get within a certain range (generally 1–3 squares) of the town/place of significance, its name fades in above it and fades out as you move away. The joy in my heart is boundless. That's pretty much all for this update. I've also done about five new maps and updated some old ones, so that's always exciting. I've managed to find a crafting script similar to Minecraft, which is what I wanted from the start, so I've been making quite a few recipes for that. I intend to have all the maps I need for the first demo by at least the end of November, so, depending on how fast I work, there may be a demo out by Christmas or the start of the new year, boys and girls. I hope you all are as excited as I am.